Oriana Camelback Truss Bridge Peacock Texas Salt Fork of Brazos River. 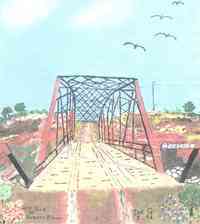 The Oriana Camelback Truss Bridge was built by the Missouri Valley Bridge & Iron Co., Leavenworth, Kansas. 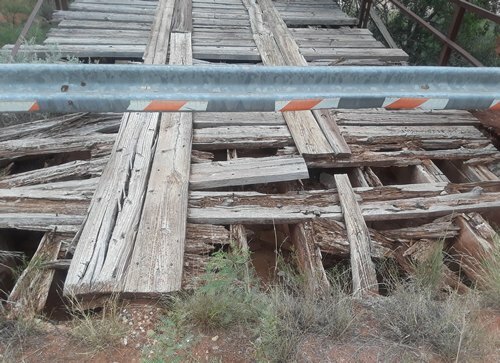 Completed in June 1917, the concrete supports collapsed by October of that year and repairs were made by The Austin Brothers, Bridge Company of Dallas. The bridge was closed to traffic in 1995. 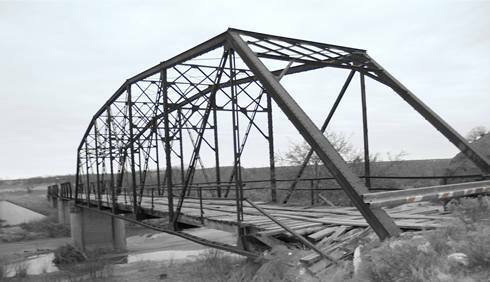 The Salt Fork of the Brazos had a second (railroad) bridge at the site - removed sometime after 1968. "We used to have parties under the bridge but I may be thinking of the New River Bridge. I know we went swimming there. Helen K. will probably remember that I almost drowned there once and once we were scared by a water moccasin - or so we believed it to be. I can't remember if there was quicksand there or if it was under the new bridge. We used to bust watermelons on the bridge and spin our tires." "Deanie, Our little community can stand all the good publicity we can get. I do have some information about the river bridge. I still have a scar from being cut by a piece of glass while wading under that bridge during a class party." 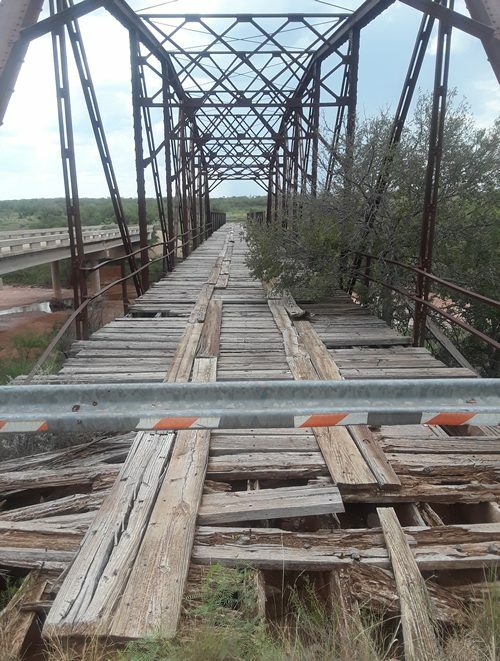 Anyone wishing to share additional stories about the bridge now known as The Oriana Camelback Truss Bridge over the Salt Fork of the Brazos River, please contact us.